This sophisticated 21 jewels mechanical/automatic edition men's watch boasts a round stainless steel case and white smooth dial that reflects its unique design. The hardlex watch glass provides a strong protection for the dial and the see-through caseback and tachymeter bezel highlights its modernity. In addition to having a day and date function and with a water resistance of 50m, the watch is finished with a stainless steel bracelet that provides a comfortable and stylish finish. 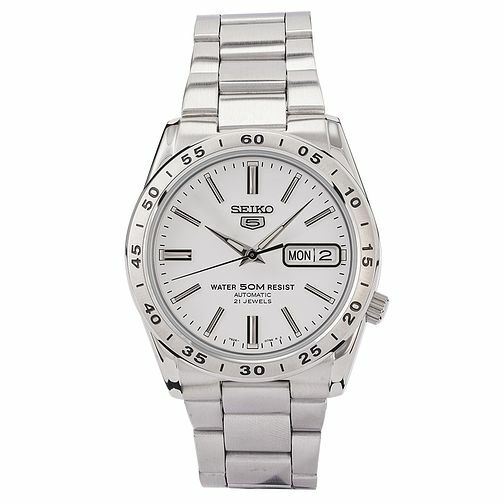 Seiko Sports 5 Men's Stainless Steel Bracelet Watch is rated 4.0 out of 5 by 1.